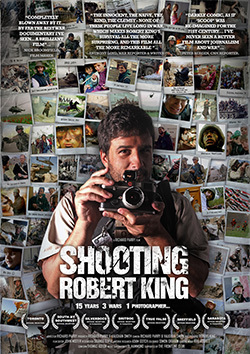 At times war photographer Robert King resembles a heroic misfit straight out of the pages of Scoop, thrown into the heart of battle, struggling to adapt to the brutal environment he finds himself in. Occasionally comic, often touching, more often dark, Shooting Robert King, the tale of Robert King, is a unique and personal journey, a film which follows him over 15 years and through three wars. His journey starts in Sarajevo in 1993, a 23-year-old fresh out of Art College and prepared to dodge bullets on the front line dreaming of a Pulitzer Prize. His dream proves elusive. Fired by his photo agency and struggling to make ends meet, any swashbuckling allusions Robert holds for the career he has chosen quickly evaporate: as he realises this is one of the toughest professions in the world. Despite himself, Robert stays in the game, over time establishing himself as a respected professional, his work making the front covers of global media titles. Over 15 years Shooting Robert King records Robert’s life from boy to man, to husband and father. It is a biography, which leads from reckless naivety to maturity hardened by war and softened by family. It is a story, which forces Robert to inevitably question why he chose a profession, which involves an endless trail of death and destruction. I have a pre-release review copy of the video coming in the mail, and I’ll be doing a full review once I see it. In the meantime, be sure to follow the link below to the main site for a preview of the film and information about where you can purchase it. The release date is September 27. This entry was posted in News and tagged documentary, movie, News, photography, video, war, war photography on September 20, 2010 by Brian Auer. We recently started a discussion around the question “Why is Street Photography Dominated by Black and White?” and we had some great comments from the readers. Shortly thereafter, I got an email from the folks at TeNeues with regard to the “Elliot Erwitt Photo Caption Contest” I had talked about. They said that they would be interviewing Elliott the next day and wanted to know if I had any questions for him. Well… I thought that it would be cool to have a master of street photography weigh in on the conversation. So I sent the “Why is street photography dominated by black and white?” question along with “Do you ever get anxious taking pictures of people in public?” Both questions were answered in their short interview — very cool! Here’s a link to the video that they posted on FaceBook. Hop over there and check it out — they have a pretty good set of questions, and Elliott answers them in his usual humorous manner. This entry was posted in News and tagged elliott erwitt, erwitt, interview, News, photography, video on June 3, 2010 by Brian Auer. Superfad Delivers the SuperDope for Sony "Eye Candy"
This entry was posted in Roundup and tagged b&w, business, camera, canon, design, discussion, diy, Film, holga, howto, interview, link roundup, News, philosophy, photo, photographer, photography, polaroid, review, Roundup, scanner, sony, tips, video on May 18, 2010 by Brian Auer.